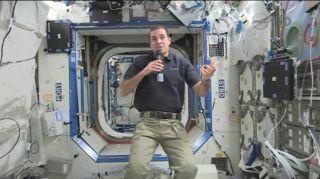 NASA astronaut Rick Mastracchio tells SPACE.com about the International Space Station's cooling system problem, and his hopes for Christmas in space on Dec. 13, 2013. Astronaut Rick Mastracchio just might find himself spacewalking in a weightless wonderland this winter to make repairs on the International Space Station, and he says he's ready for the job. A veteran NASA astronaut making his fourth spaceflight, Mastracchio is one of six crewmembers currently living and working on the space station. Last Wednesday (Dec. 11), the orbiting lab experienced cooling system malfunction that, while not a safety threat to its crew, is a problem that needs to be dealt with. "It's a serious problem, obviously," Mastracchio said in an interview with SPACE.com Friday (Dec. 13). "It's something we have to fix. It's not something I'm worried about though." Mastracchio said that aside from powering down some nonessential systems and science experiments, there has been little impact to daily life on the station. The station's cooling system issues began when one of two cooling loops on the orbiting laboratory shut down after it got too cold. NASA engineers suspect the fault was triggered by a bad valve in a pump on the station's backbone-like main truss. They have been studying the malfunction since Wednesday the hopes of fixing it remotely. "We've got some great folks on the ground and I wouldn't be surprised if they were able to get this external lop back up and working in the next couple of days," Mastracchio said. "And if they don't, the possibility exists that we'll have to out on a spacewalk to remove the old pump module and put in a new one." Engineers on the ground are testing a software patch to better fine-tune the station's faulty cooling system. Mission Controllers are planning to send up the fix to the space station computers later today (Dec. 17) in order to help regulate the temperature more precisely, NASA officials said. Engineers have also been able to get part of the problematic loop reintegrated, affording them additional control over the system. Mastracchio and fellow NASA astronaut Mike Hopkins on the station could perform up to three spacewalks, starting on Friday (Dec. 20) or Saturday at the earliest. They tried on their NASA spacesuits on Monday and the astronauts are still working today to prepare for the possibility of making the space repair. And Mastracchio is no stranger to spacewalks. He performed a total of six spacewalks during his last two space shuttle flight to the space station (in 2007 and 2010, respectively). While a spacewalk to fix the station and said he and his crewmates are trained to handle repairs like a pump module swap. "We have many spare parts on board for both inside and outside the space station, and we train for these situations over and over again," Mastracchio said. "So all the procedures and everything are in place to take care of this." Mastracchio, Hopkins and their crewmates are also gearing up for a special Christmas delivery to the International Space Station this month. Three cosmonauts from Russian and a Japanese astronaut round out their crew. On Thursday (Dec. 19) — pending the cooling system discussions — the commercial spaceflight company Orbital Sciences Corporation is slated to launch an unmanned Cygnus spacecraft to the station on its first official cargo delivery mission to the orbiting lab. Orbital Sciences has a $1.9 billion contract to fly eight delivery flights to the station for NASA. Mastracchio said he is expecting some goodies on the flight, including some new clothes, special foods and other treats from his family back on Earth. "There was talk of some fresh fruit," Mastracchio said. "And any time we get fresh fruit or vegetables, it's a great treat." And of course, Mastracchio is keeping watch for any space sightings of a Christmas icon. "Of course, we're always keeping an eye out for Santa," Mastracchio said. "I don't know if he can get up this high to visit us, but if so, we'll report any sightings to Houston." Editor's Note: This story was updated with more detail about the possible spacewalks to repair the space station's cooling system on Dec. 17 at 11:45 a.m. EST (1645 GMT).